The sauce for this recipe is outstanding. Make it a day ahead for the flavors to develop. And it can also be used for many other pasta dishes. 1. In a large, heavy pot, cook sausage, ground beef, onion and garlic over medium heat until well-browned. Stir in crushed tomatoes, tomato paste, tomato sauce and water. Stir in sugar, basil, fennel seeds, Italian seasoning, salt, pepper and parsley. Simmer, covered, for 1 1/2 hours, stirring occasionally. 2. Bring a large pot of lightly salted water to a boil. 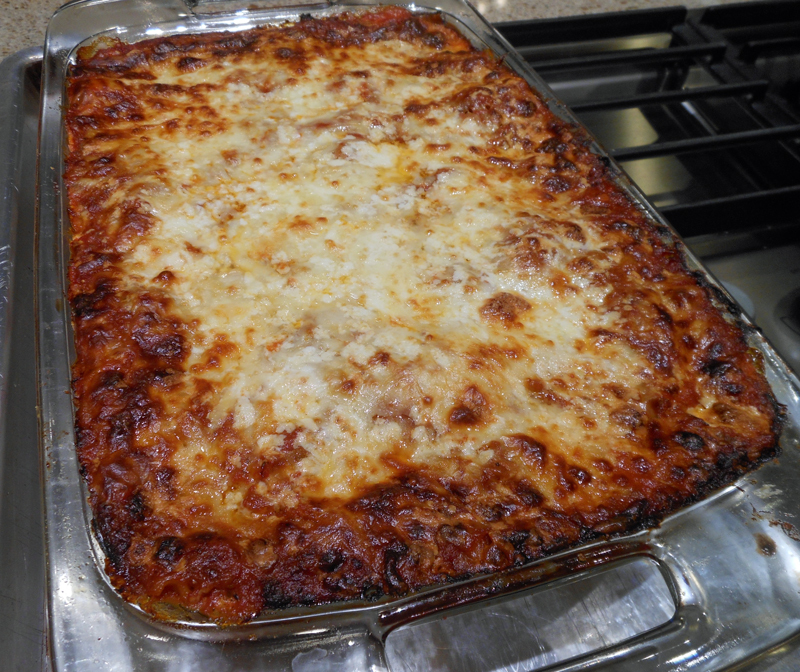 Boil lasagna noodles for 8 to 10 minutes. Drain noodles and rinse with cold water. In a mixingt bowl, combine ricotta cheese with egg, parsley and salt. 4. Spread 1 1/2 cups of meat sauce in the bottom of a 9 x 13-inch baking dish. Arrange 6 noodles lengthwise over meat sauce. Spread with one half of the ricotta cheese mixture. Top with half the mozzarella cheese. Spoon 1 1/2 cups meat sauce over mozzarella, and sprinkle with 1/4 cup Parmesan cheese. Continue layering: 1 1/2 cups sauce, 6 noodles, remaining ricotta cheese, 1/4 cup Parmesan, 1 1/2 cups sauce, remaining half of mozzarella and 1/4 cup Parmesan. Cover with foil; to prevent sticking, spray foil with cooking spray so cheese doesn’t stick to the foil. Bake for 25 minutes. Remove foil, and bake an additional 25 minutes. Cool 15 to 20 minutes before serving. This was absolutely amazing. The dark edges were fought over…LOL. So delicious!!! This will be my go-to sauce from now on.